Curses, Fates, and Soul Mates! Sharing Reading One Book at a Time! ALSO, PLEASE NOTE: THIS WEBSITE HAS BEEN RELOCATED TO http://www.authorrkryals.com, AND A LOT OF FEATURES AND ETC. AVAILABLE HERE WILL NO LONGER BE AVAILABLE AFTER NEW YEARS. THE NEW WEBSITE IS MUCH EASIER TO NAVIGATE, WILL BE LOADED WITH FEATURES, A FUTURE WEBSTORE, A BLOG PAGE, AND A CONTACT FORM THAT HAS MADE IT MUCH EASIER TO CONTACT ME. ANY WEBSITE REFERENCE IN THE POST BELOW IS TO THE NEW WEBSITE AT http://www.authorrkryals.com. THANK YOU SO MUCH! I LOVE YOU ALL! New year post and exciting upcoming news! Hi, All! I know I’ve been kind of scarce. I’ve been in and out of doctors for a weird bout with rotator cuff tendonitis, tennis elbow, and sciatica. All on the left side of the body. It’s really weird. Lol! Not the sciatica (the beast) because I’ve had that before but the rest. Anyway, there’s really been no ill effect on my work, although it’s slowed me down a little, which will probably put Revelation coming out the middle of January (rather than this month) and City in Ruins out the end of January (which is an unchanged release for that book) at the moment. I’m doing physical therapy exercises a few days a week from home and etc. and alternating heat and cold and that helps a lot! But enough about me < Cause that’s totally boring! I have so many exciting things coming up for 2015! Not only do I have quite a few books releasing, headed up by Revelation and City in Ruins, but I have some super exciting news for two of my released works, The Story of Awkward and In the Land of Tea and Ravens. Hopefully, I won’t have to be vague for too long. I have two pieces of exciting news for The Story of Awkward, both which I should be able to announce in January. Hopefully, the news for In the Land of Tea and Ravens won’t be too far behind! 😉 I’m truly excited. That said, I want to share something really amazing with all of you. Since the Story of Awkward went free, it has gotten over 50,000 downloads, and the messages/emails/etc I’ve received about the message in this book have been awe-inspiring. This means so much to me for so many reasons. I make no profit off of the The Story of Awkward ebook, as it’s free on all ebook outlets. And since I’m unable to sell the paperback free through its current service, all of my proceeds are being donated to an anti-bullying and eating disorder (because both of these are incredibly personal things for me) organization. Writing is such a passion for me, but being able to use it in powerful ways is another incredible passion for me, and I’m hoping to do much more of this in 2015. I’m working really hard, too, to make my new website (I’ll post the link in the comments) easy to navigate and full of special things (maps, special fantasy effects for my fantasy novels, book facts, and more). I’ll also be posting my weekly giveaways on the website as well as Facebook, and you can enter on both forums, since I’m afraid the changes on Facebook may make it really hard to see them on it. Also, I promise I check all messages though sometimes if I’m in the writing cave, it may take me a few days (at most). I’ve also made it a point, that if you contact me on my FB personal/author pages to reply to your messages (when able) with a voice message because I love the idea of being there with you in your homes and not just through text. I’ve got so much in the works for this year, and so many exciting things planned for you, one of which I’m hoping to share with you next weekend 😉 Also, I mail out a LOT of books. Sometimes over 20 a week on a busy month for giveaways and etc, so if something does not arrive, please don’t hesitate to message me with the book that didn’t arrive and the mailing address (or email in case of an ebook). International to the UK is usually my hardest because, for some reason, it gets caught in customs a lot. I’ve started mailing priority to the UK rather than media because it seems to go through better. Please know that even if it hasn’t come, it’s coming! Also, I’m working to get a web store set up on my website this year for signed books and swag. A few of the items sold will be to benefit charity. I’ll make note of which ones and which charities. This is all a work in progress, but so close to a reality! I adore you all! NEW WEBSITE UNDER CONSTRUCTION AT http://www.authorrkryals.com This website will remain live until the new site is completely finished, but please feel free to head over to the new site for up to date listings! This page offers all things R.K. Ryals. Check out chapter sneak peeks, upcoming events, fan page links, book links, and book news! Please enjoy your visit! You can also find her on Twitter, on Facebook and on instagram. Or on her Amazon author page. DANCING WITH THE DEVIL IS HERE! The third book in the Thorne Trilogy is finally available for purchase! Currently it is available on Amazon HERE and on Barnes and Nobles HERE and will soon be available on all other outlets. 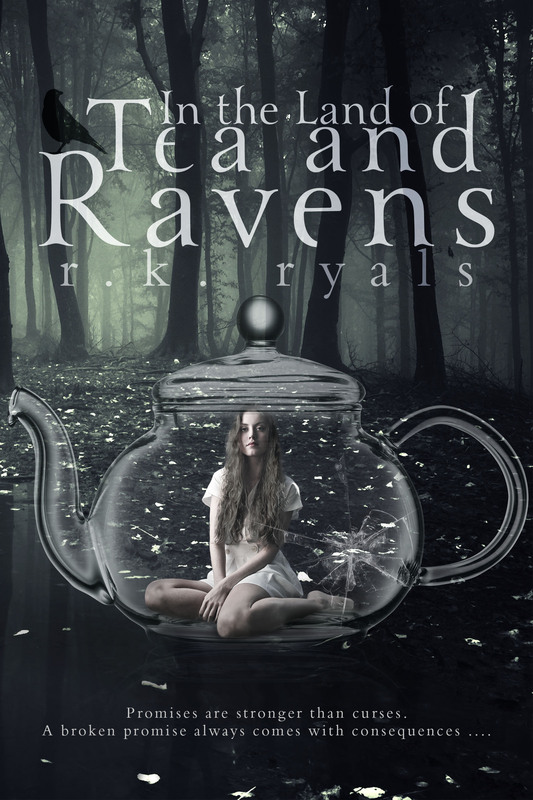 A brand new release coming November 15 is a new, different read from R.K. Ryals titled In the Land of Tea and Ravens! This book is now available for pre-order on Amazon HERE and will be available for purchase on other outlets on November 15, the official release day. Be on the lookout as other books may become available for pre-order as they near release. The Story of Awkward is now FREE on all outlets!!! Check out author R.K. Ryals’ Facebook page at http://www.facebook.com/RKRyals and this personal message from the author on youtube to find out why! 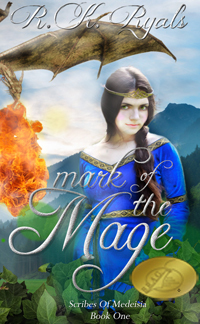 Mark of the Mage is now an Indie B.R.A.G Medallion honoree! There’s nothing so satisfying as stumbling upon a book that captivates you from start to finish, a book whose characters become your friends and people you care about, and the world a place in which your imagination is allowed to breath.